Depending on size, slice cherry tomatoes into halves or thirds. 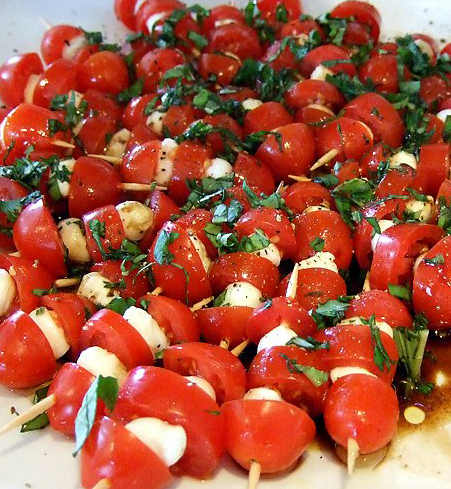 Alternating tomato slices and mozzarella balls, skewer them onto toothpicks and arrange on a platter. Chiffonade basil by layering the leaves neatly in the same direction, then roll the stack lengthwise into a tight cigar shape. Slice across the rolled leaves for thin strips. Sprinkle the basil strips over the arranged skewers. Whisk balsamic vinegar vigorously, and then drizzle in the olive oil. The ratio of vinegar to oil should be 1:3. Pour over skewers and finish off with cracked pepper.